Lyon or Amiens, France, ca. 1450-1460. Purchased on the Fellows Fund, 1985. London, Sotheby's, Dec. 11, 1956, lot 13; Charles J. Sawyer, London; London, Christie's, June 19, 1968, lot 115; Everett and Ann McNear, Chicago, and William and Mary Lloyd, Winnetka, Ill; Everett and Ann McNear, Chicago. Ms. book of hours for the use of Lyon (Hours of the Virgin, Office of the Dead); written and illuminated in Lyon or Amiens, France, ca. 1450-1460. The manuscript is undoubtedly for the use of Lyons but the calendar is essentially a Paris calendar with added feastdays for Lyons and Amiens. The miniatures show Amiens influence as well. 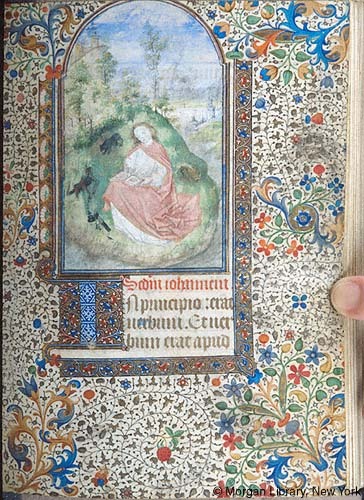 Decoration: 15 large miniatures, 2 marginal historiations, full illuminated borders on miniature pages, partial illuminated borders on many text pages, numerous illuminated initials and geometric line fillers; female donor is shown in prayer before the Virgin and Child on fol. 186r.